Jewellery in India irrespective of gender has always played a prominent role since ancient times. From temples to the homes it is an integral segment of the society. South India is a paragon of vibrant art and culture. Here people value royalty over anything. South Indian Jewellery is uniquely designed giving the glimpses of its culture. The age-old traditions, cultural dance, and music, tantalizing cuisine, majestic temples, and all of the above, the personality of a South Indian, everything amplifies the flamboyancy of the Southern part of India. The divine looking Jewellery be held by the South Indian beauties plays a consequential role in Southern tradition. 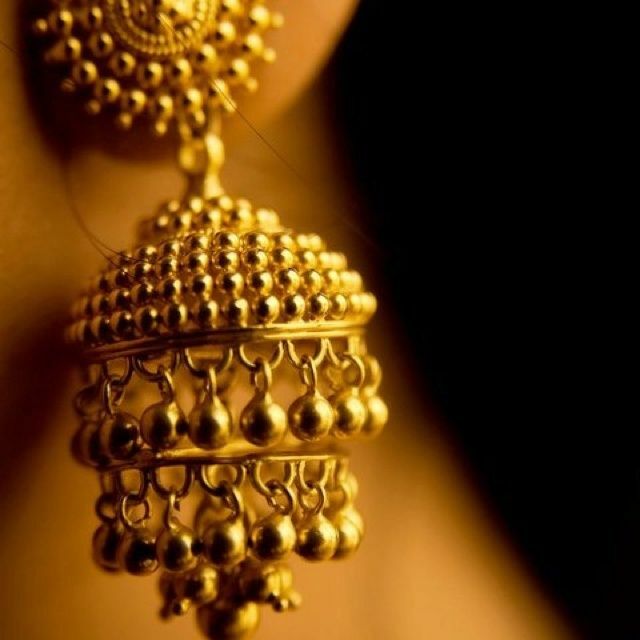 The Significance of South Indian Jewellery in its society is unmeasurable. 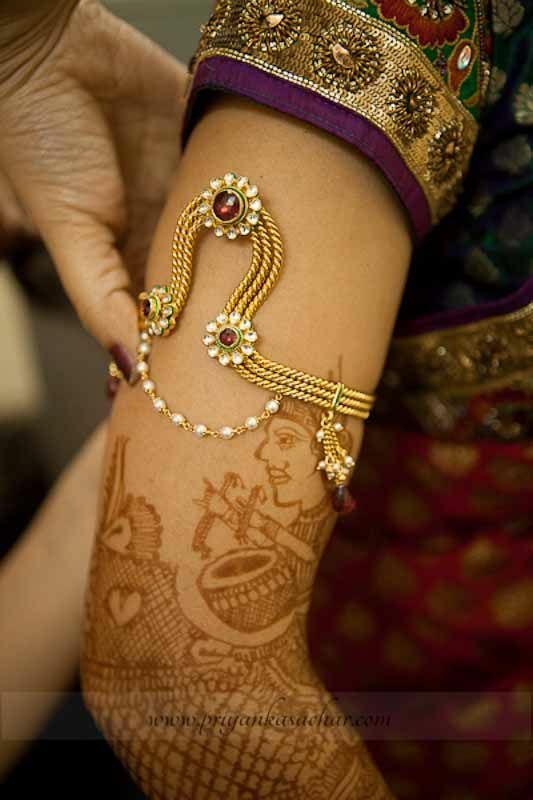 Maganlsutra, the sacred thread is the depiction of marital chastity and dignity in the Indian Society. The legends say Mangalsutra was originated in South India and that it has been traveled from here to the other parts of the country. In South India, different regions have different terms specified for it. Tamil – In Tamil areas it is called as Thaali or Thirumangalyam. Mangalsutra is a pendant which is unique in various castes and sub-castes. It is worn with ManjaKayiru, a golden chain or a simple thread dyed in turmeric paste on the wedding day. Another way of wearing it is with the traditional black bead chain called Nallapusalu. Kerela- The Syrian Christian communities here wear Minnu. It is similar to that of Thaali except the fact that it has a cross motif on them. The Hindu community calls it Ela or Elagu Thaali. Abiding by the meaning of Ela, i.e. leaf he traditional design includes a leaf imprint on it. Even the Muslim communities of South Kerala wear Thaali. Telugu – In Telugu community the Mangalsutra is called by various names such as Mangalasutramu, Pustelu, Maangalyamu, Ramar Thaali and Bottu. Precious stones like pearls and corals are used in its making. The traditional pendants here include two disc or cup motifs made of gold. A waistband or a waist belt is used in two ways in the South Indian tradition. One, it is used as Aranjanam for the infants and other as Vaddanam for the women. Aranjanam- Its primary purpose is to measure the healthy growth of the child by the increased size of the waistline. Parents in South India believe it to be a protector against the evil spirits. It has “Thayathu”, which is a small capsule that stores the dried umbilical chord. According to our ancestors, these cells help in curing many diseases. Vaddanam- It is a part of Solah Shringhar and is worn by women on auspicious occasions. Vaddanam is a vital part of the South Indian brides’ jewellery. Known as VANKI in South India, signifies the ability of strength and virtues. The temple armlets resemble the temple sanctum or have Goddess Lakshmi as its principal centerpiece. Bangles are an important part of ornaments in Indian tradition. Where red bangles signify ritualistic relevance, the green in South India means prosperity and fertility. 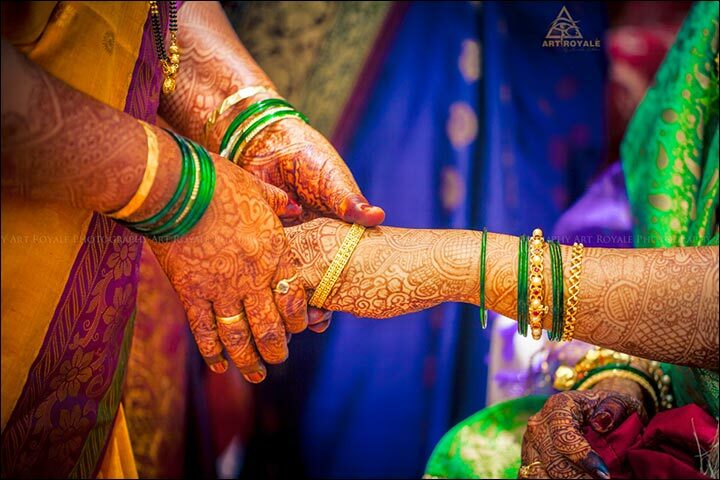 Green bracelets or bangles are presented by the Bride’s mother to her daughter before the marriage as she prays for her well-being. Wearing a necklace creates spiral bliss which is then transferred to the whole body. South Indian necklaces have set their fashion statement High in significance; these are an essential part of Solah Shringhar. Ornaments made of coins are a statement of wealth in South India. The blend of gold with diamond and other critical gems bring forward to the most beautiful necklace designs. Some of them are Mango Mala, Polki Necklace, Kundan pieces, and Guttapusalu Haram or the Pearl necklace. Wearing earrings is considered as a sacred act. A scientific reason for why earrings are essential is that ears have a hunger point which can be used to maintain a healthy lifestyle. A few earrings are Makara kuzhai, Maattal, Lolakku, and Olai. 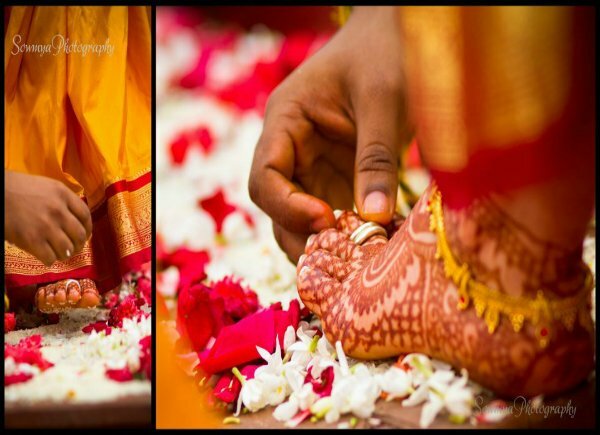 It is said that during the ancient times, women were made to wear anklets which made noise so that the people in her house gets to know that she was coming. By this, they would welcome her with respect. The sound made by it signifies to people around that they should behave properly as a woman is in their premises. Toe ring is worn by married women to increase the chances of conception. Where unmarried women wear plain rings, married women wear heavy rings in the center toe of each foot. These are known as Mettelu in Telugu, Metti in Tamil, and Kalungura in Kannada.